The timeless classic tale of how the 12 animals in the Chinese Zodiac were chosen (and why there is no cat). A long time ago in ancient China, the Jade emperor, ruler of heaven and earth, proclaimed a great race: the first twelve animals to cross the river would each have a year named after them - and be immortalized in the Chinese Zodiac. The animals lined up along the shore, eager to begin. Some chose to race honestly; others were more devious. Some helped their friends along the way; others raced alone. Some were distracted; others focused with all their might on winning. But there were thirteen animals racing for only twelve places. Who would come first? And who would miss out? Author Gabrielle Wang was born in Melbourne, Australia, of Chinese heritage. Her maternal great-grandfather arrived in Australia during the Gold Rush and her father came from Shanghai. 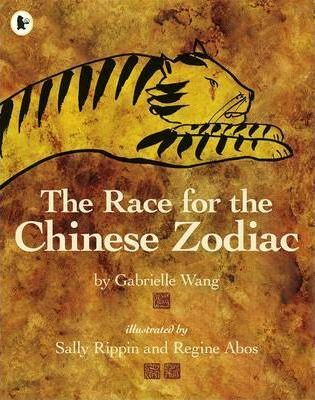 Gabrielle's numerous novels have won multiple awards; The Race for the Chinese Zodiac is her first picture book. She lives in Melbourne with her partner and two children. Born in Darwin, Australia, illustrator Sally Rippin grew up mainly in South-East Asia. She writes and illustrates for children of all ages, and has had over fifty children's books published, many of which have won awards. Sally lives in Melbourne. Regine Abos is the designer of many popular titles, both works of fiction and picture books. She lives in Melbourne.